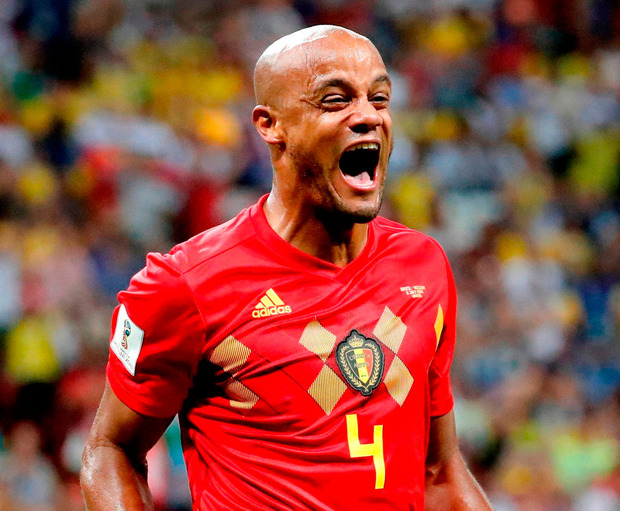 Belgium sent Brazil crashing out of the World Cup last night in the latest twist of this thrilling tournament. The stunning success for Roberto Martinez's side in Kazan guarantees a European winner after France knocked out Uruguay earlier in the day. An own goal from Fernandinho and a fine Kevin De Bruyne strike gave Belgium a two-goal lead at the break. Renato Augusto's header prompted a late Brazilian rally and Neymar - who frustrated with another erratic display - was denied by a brilliant Thibaut Courtois save deep in injury time. Brazil's exit has further increased the anticipation levels around England's prospects with manager Gareth Southgate trying to manage expectations ahead of their quarter-final with Sweden in Samara today. But he has acknowledged that his relatively youthful group are conscious that they have an excellent opportunity to take a giant step. "We are one of the youngest teams in it but we are an improving side that wants to make our own history," he said. "We've had our first knockout win in ten years, a first penalty shootout win in a World Cup and it's not since 1990 that we've been in a World Cup semi-final. "We are hugely ambitious and want to do that but there's nothing else in our mind apart from this game. "It's dangerous territory now. I've been in football for 30-odd years and you're never as good as people say in times when things are going well. But you're never as poor as people say when things are going badly. I'm balanced and focused on preparing in doing as well as we can." Sweden are cast in the role of underdogs again, yet that's a familiar berth for the Scandinavians who have surprised teams both in qualifying - where they advanced ahead of the Netherlands and Italy - and in the competition itself. "It's a team that has better players than people give them credit for," said Southgate. "They are obviously very strong. The organisation is key, the way they work together to limit opportunities and defend their box strongly and we know the challenge we face." His captain Harry Kane was on message too. "People will say we have better individuals and play for bigger clubs but in tournament football that doesn't matter," he said. "The best thing about them is that they stick together on the pitch." However, the Spurs striker stressed that England's bond was strengthened by their dramatic triumph over Colombia on Tuesday. "When you go through a battle like that and come out winners, it gives you the energy to go out and do it again," he continued. "We're hungry for more and we want that feeling. We are like family. I look at them (rest of squad) like my brothers and they're exactly the same. We will do anything for each other and that's what we will do for the rest of the tournament." Sweden coach Janne Andersson feels that England are the first side they will meet here that can match their set-piece prowess. He laughed off the suggestion that Sweden could think of themselves as potential winners. This afternoon's victors will meet Russia or Croatia in the final four. "I don't mind spending my time thinking about things like that," said Andersson. "We will come prepared, do our utmost and based on that we will keep going or not."